Is it really true that millions of people worldwide have been mysteriously misled to believe that the story contained in the so-called “Greatest Story Ever Told” was, in reality, penned by mankind, and not conceived by Satan? Didn’t Satan convince Eve to believe that she could eat of the “tree of knowledge of good and evil” and still live? Yes, Satan is the original “liar and deceiver,” and the “father of all liars,” John 8:44. A good dictionary would define a “myth” as any inventive story or any imaginary thing or person. Relative to the story “Greatest Story Ever Told,” one definition is an unproved or false collective belief that is used to justify a social institution. But, how does one show that the “Greatest Story Ever Written” is a “Myth”? Can Yahweh’s Word do the job? What facts of today’s story of X-mas are real? Are Scriptural? What reality is there in the use of the “Manger Scene”? The “Date”? The “Yule Log”? The “Christmas Tree”? The “Mistletoe”? “Holly” and “Wreaths”? Read on to find out. 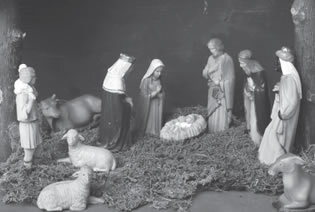 Today, the manger scene can be seen in front of many church buildings, in numerous store windows, and, in some cases, on someone’s front lawn. Generally, the scene depicts a baby (representing our Savior) lying in the manger, next to an inn, with His parents (two statues representing Mary [Miriam] and Joseph) beside Him. One must remember a manger is a trough from which cattle or horses would eat grain. Also depicted on this scene would be three wise men (magi), each bearing a gift (gold, frankincense and myrrh) to be given to the Baby. This last part of the scene is rather misleading. First, Scripture speaks of the wise men visiting Yahshua as a young child (not a baby) and of the visit happening in a house. 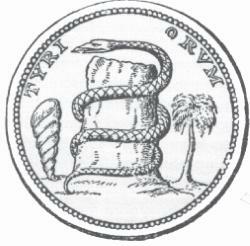 The Greek word oikia, translated as house in Matt. 2:11, specifies this as the abode to which the wise men came to see Yahshua as a child. The Greek word kataluma is used and translated as inn in Luke 2:27. Neither of these two Greek words is ever translated as the other. And there were in the same country shepherds abiding in the field, keeping watch over their flock by night. And, lo, the angel of Yahweh came upon them, and the glory of Yahweh shone round about them: and they were sore afraid. And the angel said unto them, “Fear not: for, behold, I bring you good tidings of great joy, which shall be to all people. For unto you is born this day in the city of David a Saviour, which is the Messiah, the Master,” Luke 2:8-11. Is wintertime the time of year for shepherds to be in the fields caring for their flocks of sheep? NO! “In ancient Rome, the largest Solstice holiday was the Saturnalia, in honor of the harvest god Saturn. Not many people today have heard of Saturnalia, or know that most of our popular holiday customs are directly descended from the ancient holiday season. Saturnalia was a big holiday – businesses and courts closed for days. The halls were decked with holly branches and evergreen wreaths. “People visited family and attended lavish banquets and holiday parties. Gifts of silver, candles, figurines, and sweets were exchanged. Another popular custom at Saturnalia involved slaves and their owners swapping roles. The equality of all was emphasized by wearing (even the emperor) of the red felt pileus cap of the freed slave – headgear that has long gone out of fashion, except for the character of Father Christmas, aka Santa Claus. “So how did a raucous Pagan celebration become associated with Christianity? Very intentionally. At the time of the date of [Yahshua’s] birth was officially assigned [the Messiah’s] birthday, Rome was pretty thoroughly Christianized, but the former pagans were more reluctant to give up the holiday than they were their gods. After brushing aside inconvenient facts, the names were changed – but the holiday remained the same. “Nativities were celebrated at Christmas-time, including that of Mithras, known throughout the empire as ‘the light of the world,’ and the nativity of Sol Invictus, the birthday of the sun. “Another Roman festival at the same time as Christmas was dedicated to Sol Invictus (‘the invincible sun’). Originally a Syrian deity, this cult was imported by Emperor Heliogabalus into Rome and Sol was made god of the state. With the spread of Christianity, Christmas celebration became the most important Christian festival. In the third century various dates, from Christmas to April, were celebrated by Christians as Christmas. January 6 was the most favored because it was thought to be [Yahshua’s] Baptismal day (In the Greek Orthodox Church this continues to be the day to celebrate Christmas.). In the year 350, December 25 was adopted in Rome and gradually almost the entire Christian church agreed to that date, which coincided with the Winter Solstice and the festivals, Sol Invicta and Saturnalia. Many of the pagan festivals were incorporated into the Christmas celebration and are still observed today. “Germany is credited with starting the Christmas tree tradition as we now know it in the 16th century when devout Christians brought decorated trees into their homes. Some built Christmas pyramids of wood and decorated them with evergreens and candles if wood were scarce. It is a widely held belief that Martin Luther, the 16th-century Protestant reformer, first added lighted candles to a tree. Walking toward his home one winter evening, composing a sermon, he was awed by the stars twinkling amidst evergreens. To recapture the scene for his family, he erected a tree in the main room and wired its branches with lighted candles. 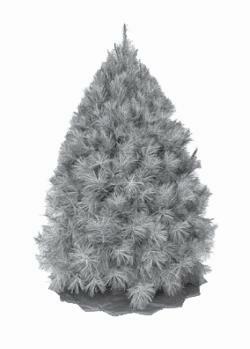 “Most 19th-century Americans found Christmas trees an oddity. The first record of one being on display was in the 1830s by the German settlers of Pennsylvania, although trees had been a tradition in many German homes much earlier. The Pennsylvania German settlements had community trees as early as 1747. But, as late as the 1840s, Christmas trees were seen as the brilliance of pagan symbols and not accepted by most Americans. Now, who is Nimrod? Nimrod was the grandson of Ham, the son of Noah, Gen. 10:1-8. The book mentioned above indicates that Nimrod founded Babylon and Nineveh. This book also reports that Nimrod’s wife was named Semiramis, and that both were deified. Reportedly, Semiramis is called the queen of the heavens under the name of Astarte (queen of the heavens – Astarte – Easter). Thus saith Yahweh, “Learn not the way of the heathen, and be not dismayed at the signs of heaven; for the heathen are dismayed at them. For the customs of the people are vain: for one cutteth a tree out of the forest, the work of the hands of the workman, with the axe. They deck it with silver and with gold; they fasten it with nails and with hammers, that it move not." Sure sounds like what is done at Christmas time. It is estimated that there are over 12,000 cut-your-own Christmas tree farms in the United States and over one million acres of land devoted to produce some 34 to 36 million Christmas trees each year. The truth of the Christmas story is staring you right in your eyes. If you celebrate December 25 as the date when the Messiah was born, you are showing your allegiance to an idol. Instead of celebrating Christmas, New Year’s Day and Easter, start now by turning your back on them and keep Yahweh’s Feast days that will be kept in the Kingdom. By doing so you have everything to gain.